Table 1 introduces sets of two polar (equal and opposite) word pairs that can be associated with evolutionary and developmental processes in a range of complex systems. As you look them over, think of all the events, processes, and systems you have previously described with these words .These and similar words are often useful starts at categorizing social, economic, and technological events and processes that we and our clients care about into one of two camps. Some systems operate by chance, others by necessity. Some processes are random, others predestined. Some events are indeterminate, others predetermined. Good foresight and strategy requires a balance of divergent and convergent thinking. Many social processes, such as rich-poor divides, or political relations, alternate between divergent and convergent phases. Some processes are segregating, others integrating. Some systems appear to be branching, others funnelling. Some changes look reversible, others irreversible. Some are generating novelty, others conserving sameness. Some are exploring possibilities, others running into constraints. Some promote variability, others stability, and so on. Correctly categorizing an event, process, or system as evolutionary, developmental, or a mix of both will tell the foresight professional a lot about its future. 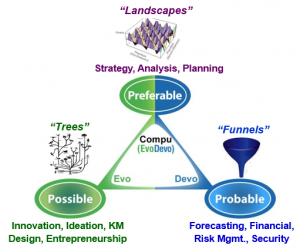 In evo devo foresight, there always key unknowns and uncertainties in any system, and key trends, processes and expected events that are probabilistically predictable. Presenting both of these is necessary to good foresight work. As we will see, we need to get enough history or experience with a system, and use appropriate foresight methods, in order to see both its evolutionary possibilities and its developmental probabilities. As described in the last section, this Guide will use an improved and slightly unconventional definition of the term “evolution”. This definition asks you to unlearn the way we used this term in college, to describe all biological change. 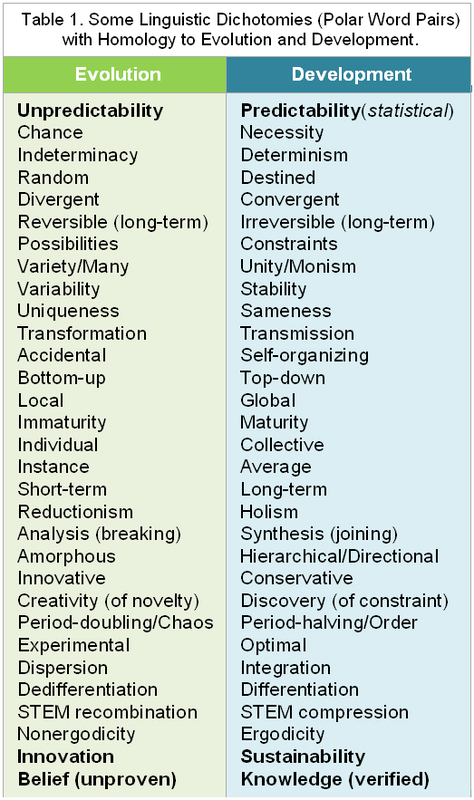 We will restrict the term evolution to describing processes of variation, divergence, experimentation, creativity, mutation, and other words we see in the left hand column of Table 1. “Development” will be used to describe the opposing processes of conservation, convergence, optimization, discovery (of natural constraint), error-correction, and other words we find in the right hand column of Table 1. The term evolutionary development, or “evo devo” will be used to describe the way complex systems use both divergent evolutionary and convergent developmental processes in Replication (as Organisms), Inheritance (as Seeds) and Selection (as Environment) in service to greater adaptation. We will find it is very useful for strategic foresight to make this separation, wherever we can, because evolutionary processes, by their nature, “fan out” into combinatorial possibilities and quickly become unpredictable. Developmental processes “fan in” toward inherent optima and thus are statistically predictable, if we have sufficient theory and computation ability, or past experience with similar developing systems. Always seeking to separate and contrast the predictable and unpredictable dynamics of replicating complex systems, whether stars, organisms, neural networks, ideas, technologies, or universes, and ask how they seem to work together to advance adaptiveness may seem like a small thing. But that small change in perspective is the main contribution and focus of the Evo Devo Universe research and discussion community, and I think it is one of the main ways we can clear up a lot of confusion about the nature and future of complex systems. This is one small improvement in focus that our community seeks to bring to the study of complexity. Complex systems are hard to describe and difficult to create, and they have many types of structural and functional organization within them. Scientists use over 40 definitions and measures of complexity, but physicist Seth Lloyd reduces them to three basic types: Difficulty of Description of the System, Difficulty of Creation of the System, and Degree of Organization of the System. We can also say that all the most interesting complex systems also strive to adapt to their environment, in order to survive and perpetuate their complexity. Thus as their complexity increases they develop increasingly intricate models, goals, purpose, and eventually minds. Living in an evo devo universe, if indeed we do, doesn’t mean that the universe is “organic” or that biology is somehow a more foundational system than physics and information, as we argued in Chapter 1. What it does mean is that this fundamental evo vs. devo dichotomy is important in all replicating complex systems, and if the universe replicates, it is fundamental to the universe as well. I haven’t been able to find that clear dichotomy represented in any other scholarly community It certainly wasn’t present in the way I was taught physics or cosmology in undergraduate classes. Yet from my perspective, the way predictable and unpredictable processes interact in the most complex systems in our known universe, living systems, seems to be at the center of their ability to adapt. That is the sense in which I think biological metaphors may apply to nonbiological systems as well. There is some kind of adaptation that complex systems do, an adaptation to each other and their environment. So I for one want to see that dichotomy continue to be explored, in all known replicating universal subsystems and in the universe itself as a system, until it is falsified. The evo devo model proposes that two fundamental change processes, Evolution and Development, work in a balanced tension with each other to create a third process, Adaptation (evo devo) in all replicating complex systems in the universe, including life, humanity, and the universe itself. These three processes of change have been depicted in Green (possible futures), Blue (probable futures), and Purple (preferable futures) We have called these the Three Ps, or Adaptive Foresight in this Guide, and when combined with the other five skills, in a Do loop, is our current best theory of adaptive management. 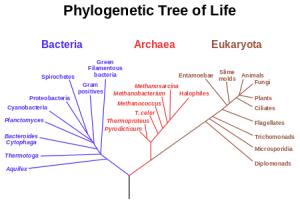 We’ve seen earlier that evolutionary processes look tree-like, developmental processes look funnel-like, and evo devo processes look like landscapes. We’ve also seen that different business functions can be predictably associated with each of these three change processes, as in the picture at right. Adaptive (Evo Devo) Foresight offers a biologically-based perspective on the dynamics and purpose of change in the universe. It proposes that one step in creating a better science of the future will be getting a better understanding of two apparently universal processes of change: evolution (“evo”) and development (“devo”). Understanding these two processes and how they interact seems critical to understanding and guiding complex systems at all scales. It also provides some answers for why acceleration of life’s informational complexity has been such a robust and valuable process, and why, how and where we can expect it to continue. Those who see the world through both evolutionary and developmental lenses know that our future must be both a set of unpredictable evolutionary “fan outs”, “trees”, or experiments, as well as a set of statistically likely developmental “fan ins”, “funnels” and destinations. That means, as foresighters, we must always strive to better understand both our evolutionary possibilities (our “futures”) and our developmental destinies (our common, constrained “future”). Biologist Marie Csete and engineer John Doyle are two scholars who view both biology and technology through what we can call an evo devo lens. 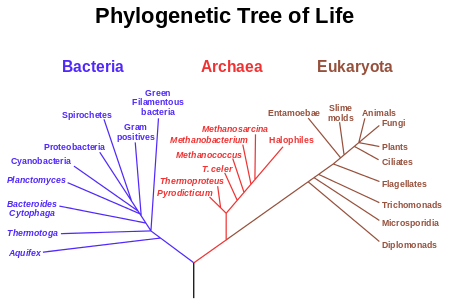 Their paper Reverse Engineering of Biological Complexity, Science 2002, 295(5560):1664-69, describes evolutionary searches and convergent evolution (development) in both biology and technology. Using a language of modules (recombinant units) and protocols (rules, algorithms), they argue that complex systems in both biology and technology seek to balance universal challenges of adaptiveness, including evolvability, efficiency and robustness. In both biology and technology there are always many unpredictable evolutionary solutions, and a few latent, optimal, convergent outcomes, or destinations. 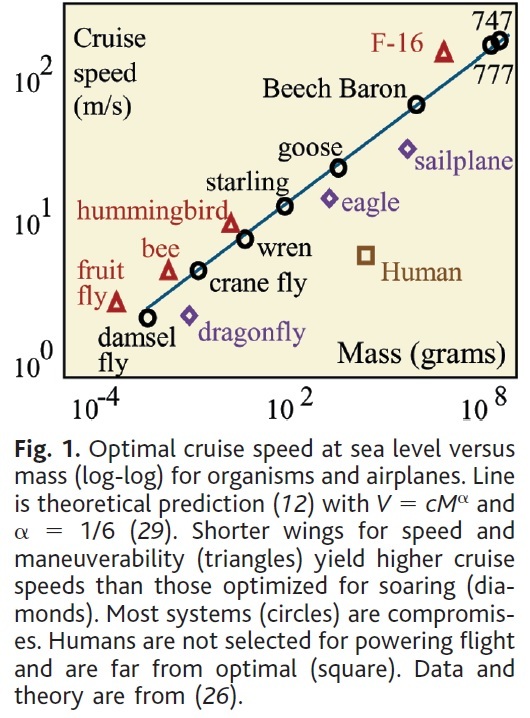 As a simple example, they offer a chart of optimal cruise speed versus mass for both biology and technology, on a log-log graph (picture left). This is an example of an allometric scaling law, and many such scaling laws have been discovered. They are among the optimal convergences to be expected in any universe with our particular dimensionality (three) and physics. As EDU scholar Claudio L.F. Martinez has noted, bow-tie dynamics are a key pattern we find in many evo devo systems. In Bow-ties, metabolism, and disease, TRENDS in Biotech, 2004, 22(9)446-50, Csete and Doyle found a bow-tie dynamical architecture in both biological and engineering systems, involving convergent fan-ins followed by variety-creating fan-outs. They propose this as a classic pattern in adaptive systems. In cell biochemistry, they describe the catabolic “fan-in” of a large variety of nutrient sources, which generates just a handful of energy molecules (ATP, NADH, NADPH) and 12 precursor metabolites, at which point our biochemistry then “fans out” to build roughly 70 larger building blocks (amino acids, sugars, fatty acids) of cell metabolism. Likewise, a large group of cell genes fan-in to each cell’s transcription and translation machinery, then fan-out to spatial control and synthesis of a few hundred thousand protein types. They find alternating fan-ins and fan-outs in a variety of technological systems, and explore how technology modules, protocols, and networks are becoming far more like biology as their complexity grows. Broder et al. in 2000 (PDF) found a bow-tie structure in the graph relationships of the emerging web. Vitali et al. in 2011 found a bow-tie structure in the ownership relationships in our global financial system, with the best large capital investment opportunities fanning in to a strongly connected core of leading institutions, and capital and contracts fanning out to connected cronies, and from there to the general entrepreneurship community. The Vitali etal. paper, with its assumptions of “control” of leading global corporations by the largest financial institutions, deserves brief commentary, as it is appears to overestimate the nature of such control. While top-down ownership and control structures are always dutifully constructed by the professional class serving the owners of capital, businesses and investments are generally much more “out-of-control.” Kevin Kelly and others have persuasively made this argument (Out Of Control, 1993), and economic models of creative destruction (see McCraw, Prophet of Innovation: Joseph Schumpeter and Creative Destruction, 2007) back it up. It is true that creative destruction is much lower in centrally planned and socialist countries, and in high value and slow-moving industries, which can quickly become cartelized and counterinnovative. But it is always high in the fastest-growing and improving industries, like information technology and nanotechnology. Fortunately, as we describe in Chapter 7, it is these and other rapidly dematerializing and densifying industries that matter most to societal futures. They are the ones driving planetary complexity to levels of intelligence, immunity, and morality far beyond anything that could ever be created by merely biological intelligence. In short, it seems implausible that our current tycoons and their political servants cannot keep accelerating disruption under control, or even slow it down much on a global level, as much as some try. We can presume this is true not just on Earth, but any Earth-like planet. We seem rapidly headed toward a postbiological form of intelligence, and that metasystem transition (emergence of a higher level of organization or control) is the dominant process we need to keep in mind in any discussion of control. Evo devo models, with their focus on the perpetual balance between divergent and convergent processes in service to adaptiveness, can help us create, anticipate, and envision the future in a deeper and more powerful way than most of us view it today. Several processes and futures that previously seemed unknown or unknowable may become clearer as you consider the world through its three lenses of evolution, development, and adaptation, the Three Ps of adaptive foresight. Your ability to see trends and examples of developmental and accelerating change will grow, and your strategy and planning will likewise improve. Most importantly from a career perspective, you will be able to do more evidence-based and valuable foresight work for your clients.In the bow-tie analogy, complex evo devo systems are always “knots” at the center of fan-in and fan-out symmetries, knots that engage in VCRIS cycles (to be discussed later) of variation, replication, inheritance, selection, and convergence. 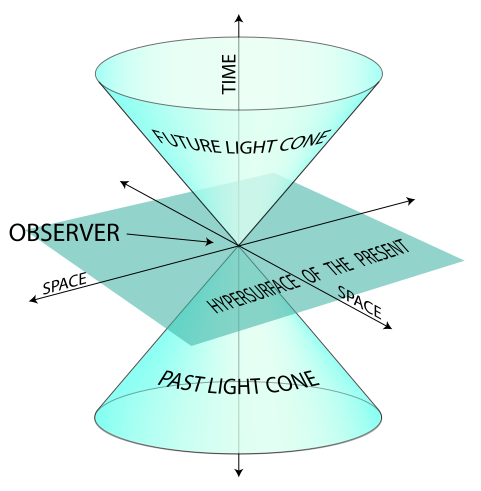 Such systems include humans, society, technology, and the universe itself, as is represented in the “Hourglass” model of human experience (picture right) and the “Double Conic” model of the possible past and future path of light in physics (picture below). I leave you to think about what kind of fan-ins and fan-outs best describe your own life. The bow-tie is just one of several useful evo devo models for change in the world. 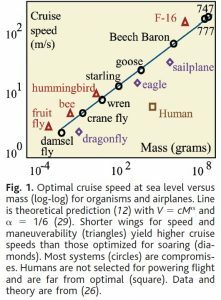 It argues that a much better understanding and balancing of these complementary processes of fan-in and fan-out, in physics, chemistry, biology, society, and technology, will help us build more adaptive and self-improving complex systems, including our computers and machines, in coming years. This chapter will help you understand both evolutionary and developmental futures, but we’ll place particular emphasis on the latter, which have been too long ignored by a sizable fraction of the foresight practitioner community. This in turn often keeps our foresight work both too unconstrained (even silly at times) and too uncertain to be of great use. When we ignore the probable, we hop along on one leg when we should be striding ahead on two. The future is both a very real set of predictable destinations and a much larger set of unpredictable paths and unique choices that we take on the way to those destinations. We need to see reality from both perspectives. The evo devo model is not yet science, it is systems theory, a type of philosophy that seeks to eventually become science, or to be refuted by future scientific advances. Only time and further critique will tell us the extent to which the model can be relied on as a framework for future thinking. Nevertheless, I have used it for twenty years now, and have found much evidence and argument to support it, a brief summary of which is presented here. Our current science has found much that is long-term predictable in physics and chemistry, but it knows and says little about long-range predictability in social and technological systems. Part of this is because we don’t yet have mature theories of information and complexity. When we get to life, some believe the increased complexity, intelligence and choice available to living systems makes their long-term trajectory intrinsically unpredictable. There are a number of scholars who disagree strongly with this perspective, and I am one of those. Let’s see if we can also get you to suspect that major future-predictable aspects of human civilization are waiting patiently to be discovered. All future thinkers should have some idea of how and why the universe works the way it does, and where they expect it to go. Only the future will tell to what extent our models hold up to scientific scrutiny. While the ideas here are surely wrong in parts, hopefully they are at least usefully wrong. Please help me critique them in years to come, and show me what I need to change. With enough eyes, minds, and hearts, we’ll keep pushing the boundaries of our foresight frontiers and take better advantage of the amazing evolutionary opportunities and developmental destinies that lie ahead. Whether you think the model will eventually be validated by science or not, it may at least persuade you that there is much that is predictable about human society and the universe that we are now on the verge of better characterizing. There are many constraints on the nature and destiny of complex systems that are waiting to be better seen as our wits get sharper and we grow more scientific in our approach to the future every year.